A mermaid tail blanket turns lounging on the couch into an adventure under the sea. OK, that might be stretching it—but one of the ocean-inspired designs from Seatail is certain to keep legs cozy, and with charm to spare. Founder Julie Kluh has always loved the ocean. She channeled her own inner mermaid when she created these whimsical, comfortable blankets. The knitted tails are made with super soft cotton yarn. The scalloped detailing, hand-tied tassels, and sparkly sequins make these tails more sophisticated—but no less fun. Hi Everyone! Mermaid Julie here, Founder of Seatail, Mermaid Tail Blankets. I’m all about fun, coziness, and the power of imagination! So excited to have the opportunity to chat with you here at The Grommet :) Feel free to ask me any questions, I can’t wait to hear from you! Hi. I'm a 4'6" woman. Yeah, I know, I'm child sized. Will the children's one fit me? I love this! I'm not a good swimmer but I always thought it would be cool to be a mermaid. Now I can be a mermaid and I don't have to be a good swimmer! LOL Plus, it will keep me warm in the cold New England winters. Great idea! Hi! Is the Knit Tail Blanket machine washable? I can't help but notice the similarity to the mermaid blankets sold by other online sites. Where did you get your inspiration? In the kids' version, do both the tail and body section allow space for putting one;s feet into, or is the trail section just an adornment? 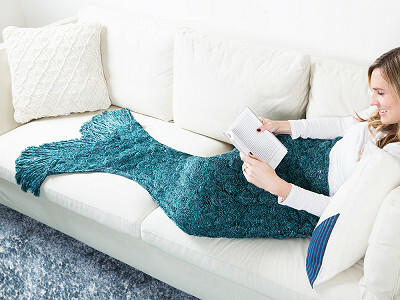 A mermaid tail blanket turns lounging on the couch into an adventure under the sea. OK, that might be stretching it—but one of the ocean-inspired designs from Seatail is certain to keep legs cozy, and with charm to spare. Founder Julie Kluh has always loved the ocean. She channeled her own inner mermaid when she created these whimsical, comfortable blankets.